Love, 31, is currently facing up to 99 years in prison for allegedly hacking into the FBI, the US Army, the US Missile Defence Agency, the National Aeronautics and Space Administration (NASA), and New York's Federal Reserve Bank during 2012 and 2013. Speaking at Westminster Magistrates' Court in London, District Judge Nina Tempia said: "I'll be extraditing Mr. Love, by which I mean I'll be passing the case to the Secretary of State." Love, his lawyer, and his family members have expressed concern about Love's well-being in the US, saying they fear for his life due to his mental health issues. Love is suffering from Asperger's syndrome. 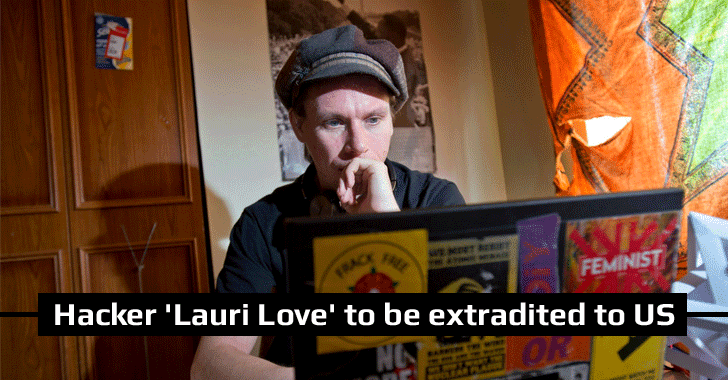 Love was initially arrested from his home in Stradishall, England in October 2013, when the British police seized his encrypted laptops and hard drives. The NCA later asked the courts to force Love to turn over keys to decrypt his computer's hard drives. Friday's ruling came a few months after Love won a case against Britain's National Crime Agency (NCA), which was demanding him disclose passwords to his encrypted computers. The mother of another British hacker Gary McKinnon, who was accused in 2002 of breaking into NASA and Pentagon computer systems and also avoided extradition to the US on mental health issues, warned Love wouldn't survive life in the US prison. If his appeal to the home secretary against Friday's ruling proves unsuccessful, Love would have 14 days to file an appeal in the High Court for permission to challenge both the judge as well as the home secretary's decision.